We visited with the Horizon's Unlimited group for two evenings at this resort near Erfoud. We stayed in a nearby campground, a room here would have cost us a week's worth of camping and eating. The meetings usually consist of PowerPoint presentations by attendees on their travels or safety/health issues. They talked me into doing one the second evening about our travels. Having not made a slide show, but having a wireless internet connection, I used our Moroccan web pages to talk about our travel to this point. Most of the attendees were doing Morocco in the reverse direction to us, so they got to see what was coming up for them. Then it was north to Ifrane, a town reputed to be the Switzerland of Morocco. We entered the Middle Atlas mountains and found cedar, fir and oak trees. 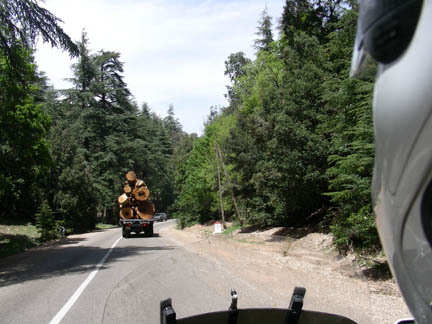 And logging trucks, three of them! This is the same cedar that was used for the ceiling of the huge mosque that we visited in Casablanca. I stopped and got off the bike and wandered through the trees for a while. As a retired forester I have a real interest in trees. I even managed to collect a few cones from them. On the other side of the pass was Ifrane. I didn't think the town looked Swiss, no steep-sided mountains with snow covered tops rising just behind the town. I think it looks more like it is in the rolling hills of Bavaria in Germany. In Casablanca I had asked a complete stranger, but an American, that was in Rick's Cafe at the same time as us if he would make a phone call for me. He also spoke French, and I was trying to contact the GoldWing Club de Maroc, but every time I called I got a lady who only spoke French. The man's name was Allan and he set up our meeting with the President of the club for us. 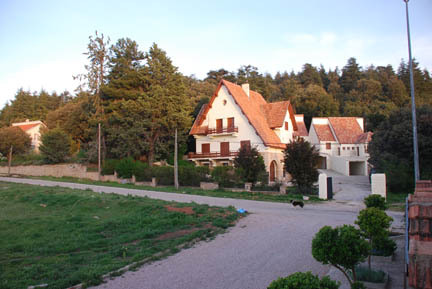 But he also gave me his phone number and said he had a house in Ifrane and to call when we were there. If they were there we could stay with them. 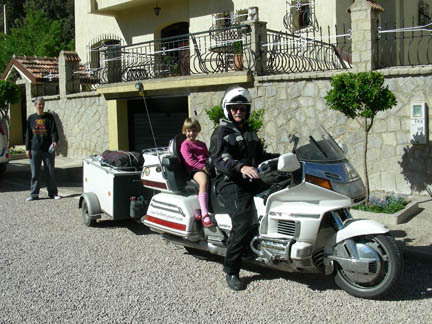 Allan and Deborah, who are also motorcyclists, and their daughter Virginia are really nice people. Even though they had hectic plans for the next day, they still welcomed us to their home. Virginia says she wants her own GoldWing. From there it is north to the Rif Mountains.